Nutrients dissolved in the aquatic environment make life possible since aquatic organisms have to directly or indirectly extract most of their required elements from the water that surrounds them. The availability of organic and inorganic nutrients limits biological productivity. Coral reefs develop best in "nutrient poor" water, but reef communities may also exist in more nutrient rich coastal waters. In order to appreciate some strategies employed in maintaining corals, one needs to understand the nutrient regulating regimes that occur on actual coral reefs; the sources, sinks, cycles and the influences the major nutrients can have on a reef community. Nutrient regulation is a major area of study in coral reef ecosystems. The principle nutrients studied are nitrogen (as ammonium, nitrite and nitrate), phosphorous (as both inorganic and organic phosphate compounds) and carbon. Although coral reefs have been shown to be areas of high gross primary productivity, their net primary productivity is quite low. The oceanic waters surrounding most coral reefs are characteristically nutrient poor, and the majority of the primary productivity comes mainly from the bottom (benthic) community not the water column (pelagic) community (D Elia, 1988). The low net primary productivity of the pelagic ecosystem is reflected in low phytoplankton standing stocks and in high water clarity. The general explanation for this high gross, but low net primary productivity is that tight cycling of essential nutrients must occur within the reef and it's organisms. The problem is that the principle pathways of cycling essential nutrients are neither well defined nor . , „ well understood (D'Elia, 1988). Three species of Acropora on a back-reef flat, Fiji. B. Carlson. Other problems include the fact that the majority of studies have focused on Pacific coral reefs, more specifically coral atolls, away from large land masses (D'Elia, 1988). These studies have usually concentrated on sections of reef that included "reef flats", areas of intensive macro- and microalgae growth. Kinsey (1983) has pointed out that different zones of a coral reef function differently, and to categorize sections of reel dominated by macro- and microalgae as "coral1 reefs may not be appropriate. Therefore the experiences gained from these studies is somewhat restricted by geography and reef type. Presumably studies of reefs near large islands, river outlets, areas of deep-water upwelling, groundwater intrusion, and even inhabited areas, also could reveal different nutrient regimes (DElia, 1988). Seasonal variations in light, rainfall, wind and temperature do exist in tropical regions and can have an effect on nutrient export from, and import to, a reef. Due to time and funding constraints, however, many of these studies occurred only during certain times of the year. Therefore, seasonal fluctuations in nutrient availability are often neglected. Seasonal differences in algal composition and cover, as well as seasonal abundance of some fish species, can also affect nutrient availability (Webb et al, 1975). Despite the problems in studying coral reef nutrient regulation, it is obvious that such regulation does occur and that it may be tightly controlled within the ecosystem of the reef. Although internal cycling definitely plays a role in nutrient regulation there is some evidence that the importance of this cycling may not be as significant as previously thought. In fact, D'Elia (1988) suggests that coral reefs may be more of an open system with a greater throughput of nutrients such as nitrogen occurring than once believed. Just to clarify before we go any further, the levels of ammonium, nitrate and phosphate that occur on coral reefs are very small compared to closed systems. Although there is some variation between reefs, ammonium, nitrate and phosphate values are all generally well below 0.05 mg/L. coral reef sites around the world. Back reef zone in Bora Bora, French Polynesia. S.W. Michael. Although nutrients are tightly cycled within a reef, there must be some nutrient input or else no growth would occur (Szmant-Froehlich, 1983). There must be mechanisms by which reefs collect and store nutrients. regarded as significant. Yet, if one considers the sheer volume of water transported, multiplied by the concentration, the potential is there for some input (D'Elia, 1988). For autotrophic (self-feeding) organisms such as corals that can use nitrogen and phosphorus in extremely low quantities, this may be enough. Upwelling of nutrient rich, deep oceanic waters is another possible source (D'Elia, 1988). 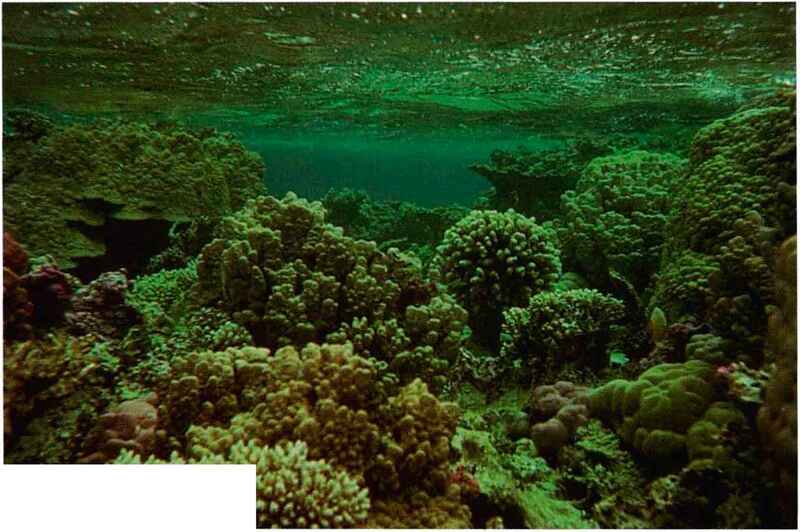 Significant amounts of nitrogen and phosphorus can be imported to reefs in the vicinity of such areas of upwelling. Upwelling occurs where major currents encounter islands, and the cold, nutrient-rich deep water flows up the slope of the island. Upwelling also occurs along the equator and western coasts of continents, where prevailing winds drive surface water away, and the deep water rises to replace it. A recent study suggests that the hydrodynamic geothermal convection process of "endo-upwelling" is linked with reef formation, and provides deep ocean water rich in nitrate and inorganic phosphate to reefs via seepage through the permeable limestone (Rougerie and Wauthy, 1993). The study proposes that an endless supply of nitrogen and phosphorous are continuously provided to reefs by this mechanism, and compares oceanic coral reefs to giant pelagic trees, with their roots in the nutrient-rich deep ocean, and their leaves in the clear, brightly illuminated nutrient-poor shallows (see Isaacs, 1977). Reefs siaiated near areas of freshwater run-off can receive significant nutrient inputs, especially when near agricultural areas. Ground-water intrusion also can cany nutrients to a reef (D'Elia, 1988). Reels around islands where birds have rookeries receive a high input of nitrogen and phosphate in the form of bird guano. The birds gather fish from a wide range in the surrounding sea and deposit their concentrated waste in a localized area. This input can significantly affect the near-shore fauna. Herbivorous fish and invertebrates such as tangs and sea urchins may offer another nutrient source. 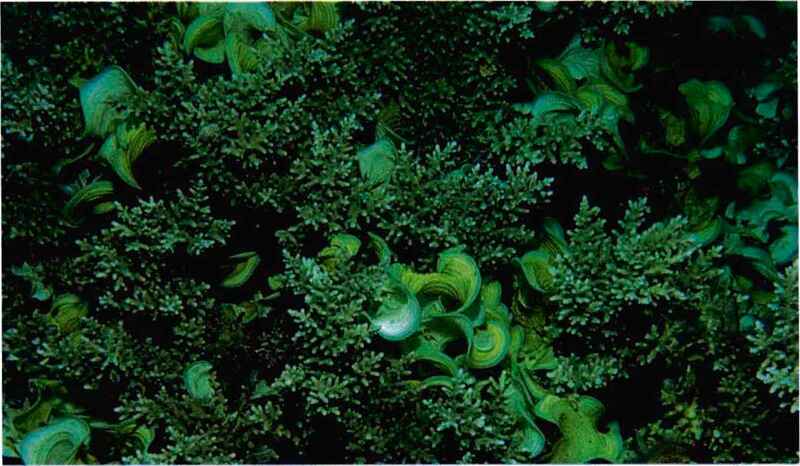 Their constant grazing of algal turfs can liberate vast quantities of detrital-sized algal fragments, resulting in nutrient transport from one area of the reef to another (D'Elia, 1988). Tangs and parrotfish crop these algal turf areas extensively. Since these fish have a low assimilatory rate, much of the fixed carbon, nitrogen, and most likely phosphorus is released back into the water in the form of feces (Weibe et al., 1975). These feces are transported around the reef by prevailing currents, supplying "packets" of nutrients to various organisms, including corals. Schools of planktivorous fish stationed over coral heads also provide nutritious feces. Studies have shown that fish schools provide significant amounts of ammonium to reef corals, resulting in increased growth (Meyer and Schultz, 1985). Fragmentation of benthic algae by wave action is also an important method of transport of carbon, phosphorus and nitrogen around a reef, and is quite important in supplying fixed carbon to balance the respiratory energy requirements of corals (Wiebe et al., 1975). Algal fragments collect in quiet zones where bacteria and other microorganisms break them down into lighter-weight detrital particles. These become water-borne and may be directly consumed by corals and other benthic invertebrates, or by worms, crustaceans, and planktonic organisms that may also be eaten. organisms that can dissolve carbonates with the aid of enzymes such as alkaline phosphatase; for example benthic algae (Lobban et al., 1985). This phosphorus can then be transported throughout the reef by fragmentation of the algae caused by wave action and grazing organisms. This form of phosphorus is known as particulate organic phosphorus (POP). The POP is, in turn, acted upon by bacteria to form dissolved inorganic phosphorus (DIP) again. It has also been shown that below a pH of 8.0 and in the presence of carbon dioxide, phosphate can be deadsorbed from calcite (Kanel and Morse, 1978; Dejonge and Villerius, 1989). Therefore, bacterial production of acids and carbon dioxide in the sediments could liberate minute amounts of phosphate. 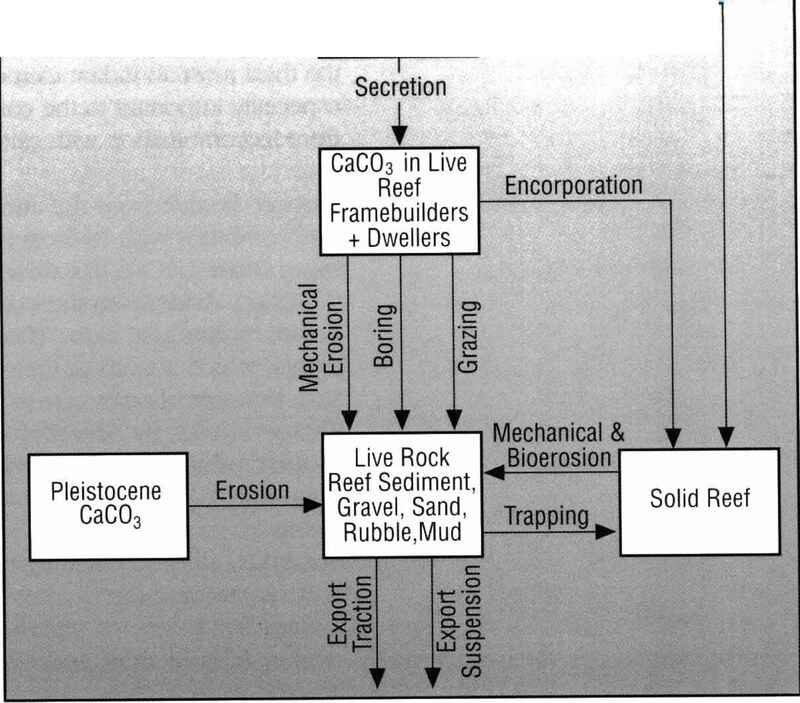 These mechanisms apply not only to soft carbonate sediments but also to consolidated carbonates such as live rock and stony coral skeletons (Webb et al.,1975). Measurements of interstitial water from surface sediments have shown micromolar concentrations of inorganic phosphorus and even higher concentrations of inorganic nitrogen, primarily as ammonium. Presumably these occur through the actions of certain bacteria. Both of these nutrient concentrations should allow for high uptake rates by benthic algae (Entsch et al.,1983). Excretion of DIP by reef organisms such as corals and fish is not considered significant. Corals excrete very little DIP as most of their phosphorus is slowly turned over. Recent work, however, has shown that inorganic phosphate release by the reef bottom (i.e. substrate, hermatypic corals, periphyton) is significant, but the subsequent uptake of phosphate from the water column balances this loss (Sorokin, 1992). Ahermatypic corals also show a loss of phosphate to the water column, and rely on their planktonic food supply for phosphate replenishment (Sorokin, 1992). Fish and molluscs make no special effort to retain phosphorus (D'Elia, 1988). Macroalgae can liberate large quantities of DIP and DOP, and can absorb DIP (Spotte, 1979). Any phosphorus that is liberated, usually as DIP, is quickly used by various organisms on the reef. As mentioned above, algae will readily assimilate DIP, yet, other organisms such as corals, bacteria and foraminiferans are important consumers too. Corals containing zooxanthellae have been found to readily absorb DIP even at low, natural concentrations (D'Elia, 1988). 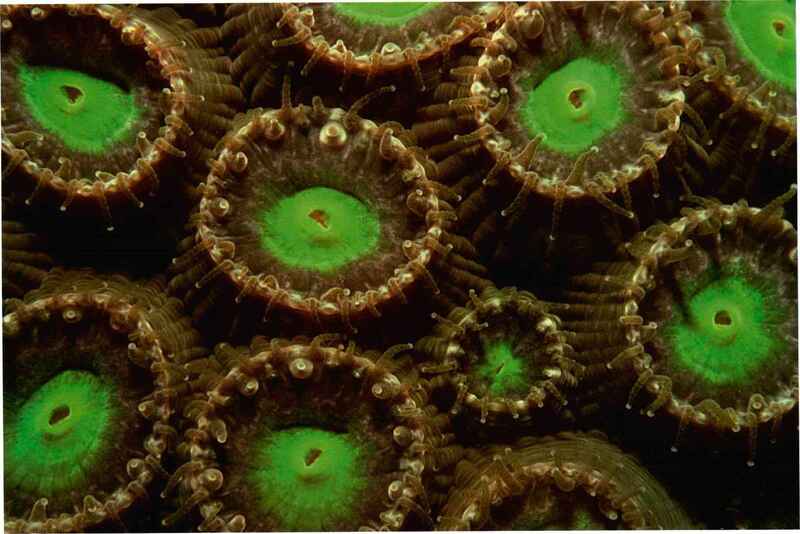 The algae within the coral tissue use the DIP from the coral for biological processes. As this DIP is depleted more diffuses into the coral tissue from the surrounding environment (D'elia, 1988). and chemisorption onto various substrates such as calcium carbonate. The relative importance of 11 îese processes compared to removal by biologic processes has not been investigated (D'Elia, 1988). 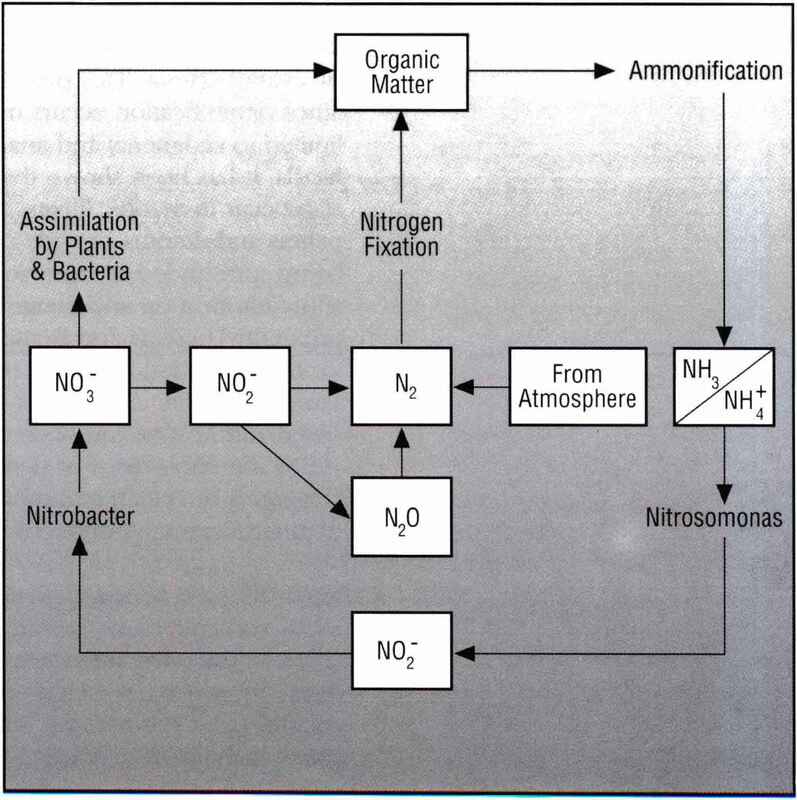 Studies of dissolved nitrogen production show a net expoit of nitrogen from the reef to the water column, in the form of nitrate and dissolved organic nitrogen (DON) (Webb et al., 1975). Nitrogen fixation by blue-green algae (cyanobacteria) in shallow 1-2 m (3-6 ft.) algal turf zones contribute to this production. These algae can fix atmospheric nitrogen then liberate up to 85% of this fixed nitrogen into the water column as DON (namely peptides and amino acids) (Wiebe et al., 1975). Some of this DON is further mineralized by heterotrophic aerobic and anaerobic bacteria into ammonium, which can be oxidized into nitrate by nitrifying bacteria. il nitrite. This nitrite is in turn, oxidized by Nitrobacterspp. bacteria into nitrate. Nitrification occurs on living reefs in a wide variety of habitats including algal flats, tidal pools, reef sediments, reef sponges, the interior of coral heads and on coral tissue (Wafar et al., 1990). Although some ammonium for nitrification comes from nitrogen-fixing cyanobacteria, ammonium excretion by reef grazers, sediment ammonium fluxes and ammonium in interstitial waters of sediments are other important sources (D'Elia, 1988). Ammonium also can be generated by bacterial action on decaying organic matter. Some of this ammonium enters the nitrification cycle and is oxidized to nitrite and then to nitrate. Ammonium also can be directly absorbed and used by algae and zooxanthellae-bearing organisms such as hermatypic corals, tridacnid clams and anemones (D'Elia, 1988). The nitrate that is produced by nitrification or released by nitrogen-fixing cyanobacteria has a variety of fates. It can be used in the biochemical pathway of respiration by either obligate or facultative anaerobic bacteria. These bacteria reduce nitrate to nitrite, and eventually to ammonium, producing nitrogen and nitrous oxide gases as waste. These gases are then released into the water and are usually either lost to the atmosphere or absorbed by cyanobacteria. This process is generally called denitrification. Since denitrification occurs mainly in the absence of oxygen, it is limited to sediments and anaerobic microhabitats such as coral heads. It has been shown that nitrification and denitrification can also occur in aerobic layers. Here anoxic microsites within iecal pellets and detritus provide a habitat for anaerobic bacteria, while being surrounded by aerobic pore waters. 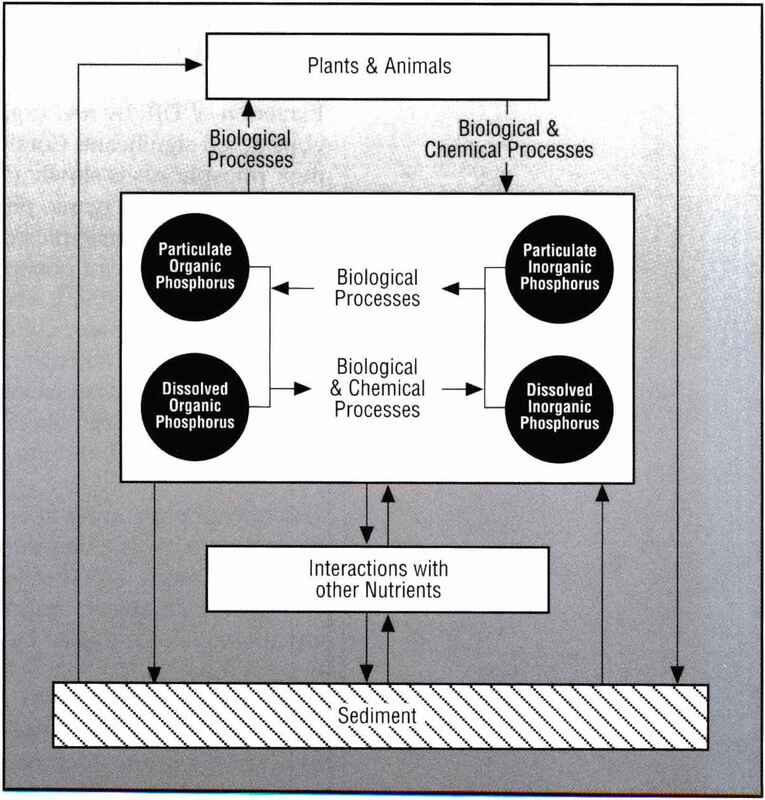 Such a system would allow nitrification and denitrification processes to occur in close proximity (Jenkins and Kemp, 1984). Most of the nitrate supplied for denitrification comes from nitrification occurring within the same sediments. Although a close coupling between nitrification and denitrification has been demonstrated (see Jenkins and Kemp, 1984), the importance of denitrification in coral reef nutrient budgets is not clear, and more information is required on the rates of denitrification in different habitats of coral reefs (D'Elia, 1988). Nitrate also can be absorbed and assimilated by zooxanthellae bearing corals, tridacnid clams, bacteria, foraminiferans and macroalgae (D'Elia, 1988). Here the nitrate is reduced to ammonium within the organism, where it is then used as a nitrogen source. When the organism dies, this nitrogen is then returned to the system, as ammonium, by decomposing organisms such as mineralizing bacteria. Carbon, the basic element of life, is the building block of all organic compounds. After hydrogen and oxygen, which form the water that accounts for at least 70% of the composition of living tissue, carbon is the third most abundant element found in most organisms. Carbon is especially important to the coral reef since the reef structure is built from its combination with calcium, strontium and magnesium. (H7CO3). Aside from these inorganic forms of carbon in the water, organic forms also exist. These come primarily from the activity of plants, which absorb inorganic carbon (as CO7) from the water and, through photosynthesis, create organic compounds. Photosynthesis by hermatypic corals also produces organic carbon in such forms as glucose and glycerol, and many varieties of lipids. Coral mucus is rich in carbon and DOC-lipids, and by shedding this mucus a coral may be releasing excess respiratory carbon fixed through photosynthesis (Davies, 1984; Crossland, 1987). This mucus, and the detritus formed by decomposing algae, forms a nutritious source of organic carbon for numerous crustaceans, worms, filter feeders, and microorganisms that respire CO7 back into the water. The exudates from algae and seaweeds is rich in simple and complex polysaccharides, organic forms of carbon that are broken down by heterotrophic organisms and bacteria, which respire CO 7 back into the water (Spotte, 1979). The respiration of animals day and night, and plants at night, also adds carbon dioxide to the water. The water is in a state of equilibrium with atmospheric CO 7, so that excess CO7 accumulating in the water from respiration is readily liberated to the atmosphere. Much of the CO7, however, does not escape, and becomes part of the carbonate buffer system. 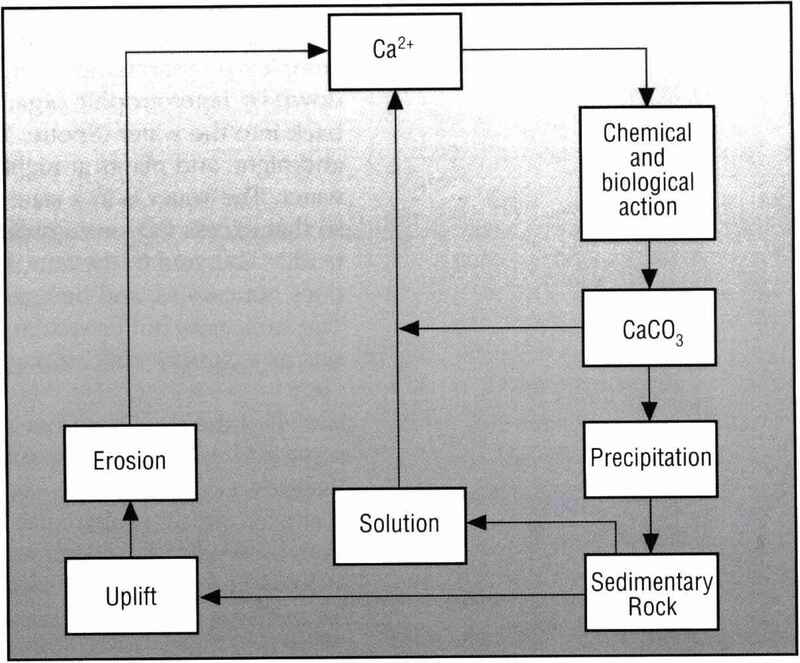 The carbonate buffer system receives CO7 from many sources and acts as a carbon "sink" (Spotte, 1979). Not all of the exudates from algae are easily broken down, and some end up as refractory substances that colour the water yellow. Phenols released into the water by the plants become poly-phenols and react with carbohydrates as well as nitrogenous compounds from both animals and plants to form this yellow "gelbstoff' (Spotte, 1979). Please refer to the section on chemical filtration in chapter 5 for methods of removing these compounds from the water. There is also exchange of carbon between the water and sediments. Reef rocks and sediments are composed of calcium carbonate, strontium carbonate and magnesium carbonate. This is deposited by the many algae and photosynthetic animals on the reef that remove calcium, strontium, and magnesium from the water and form a hard skeleton. Thus some of the carbon ends up as limestone or oolitic sand that can later fuse and harden into limestone. The formation of limestone is a global sink for carbon. Some refractory forms of carbon also accumulate in the sediments. In our aquaria this detritus is of concern since it is unsightly and contributes to the growth of undesirable algae because it also contains some organic forms of phosphorous. In seawater, the buffering system which stabilizes the pH is a dynamic system of carbon compounds. The carbonate buffer system and pH will be described in chapter 8. To summarize, a variety of mechanisms have been proposed to explain the high gross primary productivity but low net primary productivity7 of coral reefs. The commonly held view7 is that tight cycling occurs, both within organisms i.e. 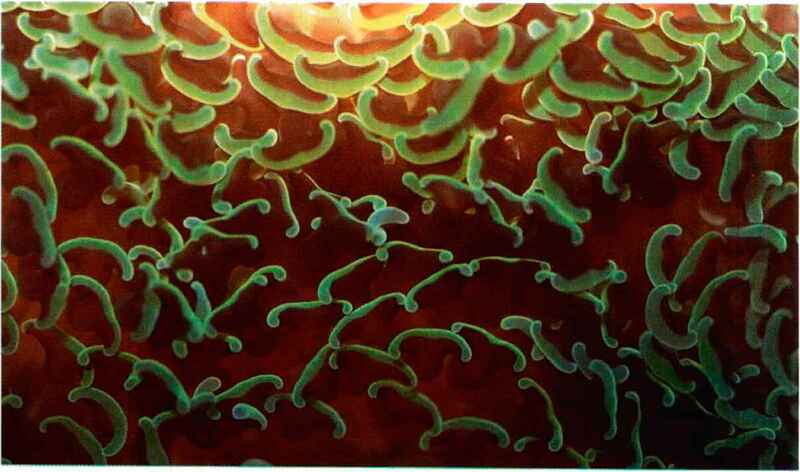 zooxanthellae-coral associations, and between organisms. However, there is evidence that suggests that coral reef nutrient budgets may be more open-ended than previously thought. In this scenario, there is a higher throughput of nutrients. Thus the external gains and losses of nutrients to internal nutrient recycling is higher than is generally assumed (D'Elia, 1988). It has also been proposed that the nutrient requirements of autotrophs such as zooxanthellae-coral associations, is much lower than previously believed based on planktonic studies, thus they are not nutrient limited (D'Elia, 1988). Although studies have shown that nutrient input from the ocean is low, it is not limiting (Wiebe, 1988). Indeed, it has been postulated that coral reefs require low7 nutrient levels to persist, otherwise macroalgae can out-compete corals for space at higher nutrient concentrations (Wiebe, 1988). Furthermore, elevated levels of ammonia, nitrates and phosphates may actually hinder their uptake by corals. Nutrient enrichment from a palm oil plantation has resulted in the increased growth of macroalgae on this reef in New Guinea. This photo shows Padina overgrowing a thicket of Acropora. S.W. Michael. the sewage outlet, calcification decreased, deposition of organic material increased, and deposit and filter feeders dominated the benthic community (Smith et al., 1981). When the sewage outlet was moved further out into the ocean, recovery became equally dramatic. Filter and deposit feeders died off, macroalgae began to decrease and corals began to recover. Much of the information contained above can be extrapolated to the creation and maintenance of closed coral reef ecosystems. We will delve more deeply into this in chapters 8 and 9- There we will explore the importance of nutrient control and loading on coral reef aquaria, and their effects on system and organism health. An additional note, minor and trace elements such as iron, iodine, strontium, and molybdenum added to closed system aquariums dramatically affect the growth of corals and algae. Silicate and sulfur compounds also affect growth of algae and invertebrates. Although these elements and compounds are not nutrients in the sense that nitrogen, phosphorous, and carbon are, their effect on the growth of corals and plants can be limiting. 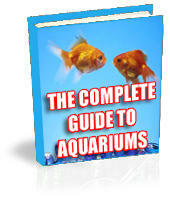 We have seen this is so in our aquaria. Little research has been done on natural coral reefs to determine whether these elements can be limiting or are even limited there. We suspect that the study of coral diseases and mysterious blooms of algae in the natural environment should include an investigation into the possible role of trace element depletion or excess respectively. Refer to chapter 8 for information about trace elements. Where is carbon, nitrogen, and phosphorus in a coral reef? How are corals so reproductive despite being in nutrient poor waters? What are the nutrient found in bora? Which one is more nutrientrich gulf and reef? How is phosphorus absorbed by plants in a coral reef?